The last couple of Saturday morning trips with Ben have been fishless. The problem is usually one of deciding where to go under the prevailing conditions. As a rule I've been somewhere during the preceding week and this gives us some idea of the prospects, however, the weather has been pretty changeable lately and each time we've got it wrong. 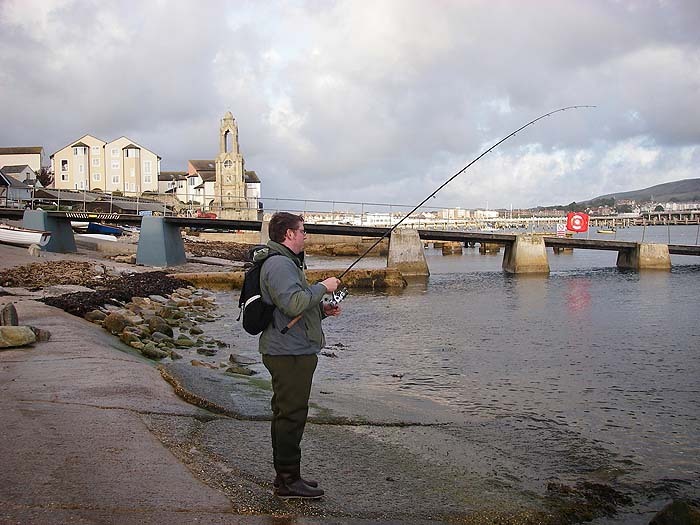 Last week I'd caught a few fish at Swanage and when we met on Saturday morning the wind seemed to be more or less offshore so we decided to give it a go again. As it happened the tide was much higher than it had been on my previous session so we could not get to the spot I wanted to fish. Conditions looked pretty good with a bit of a chop on the water and a fast running ebb current but despite us both seeing some fish (probably pollack) striking at the surface we couldn't get a sniff on the poppers. I was using a TC Pencil and Ben was fishing with a skitterpop. We flogged away for an hour or so then we decided to work our way back to the car fishing as we went. I was still quite optimistic although Ben was beginning to mutter phrases includin words like 'Jonah' and 'jinx'. 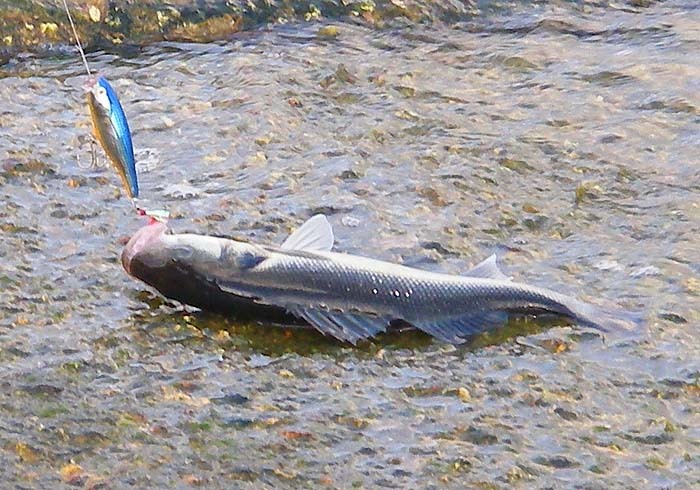 We were just about back to the lifeboat slipway when suddenly Ben's rod arched over and he was into a fish. Not a big one but nevertheless a bass and certainly a jinx breaker. 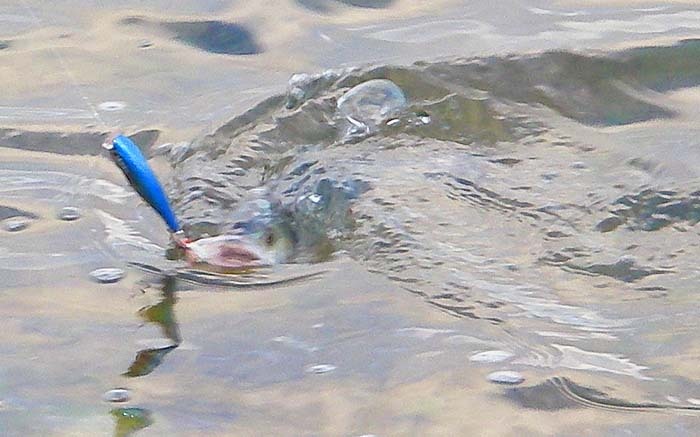 I grabbed the camera and took a few pictures as the bass was landed and released. 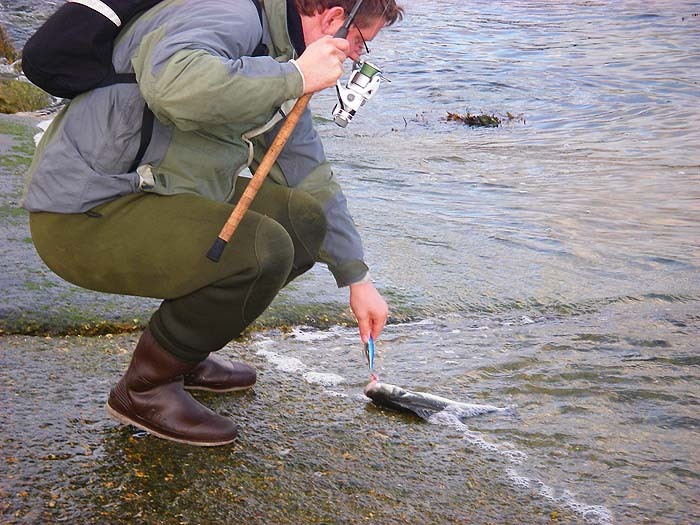 Before I could pick up my rod Ben cast again and I saw a good swirl by the lure as he had another take. This one missed the hooks and basically that was it. Not another bite between us. It's amazing how conditions change from day to day.